DeLonghi DNC65 Review - Overpriced? The Delonghi DNC65 certainly isn’t short of features, which can all be controlled by the simple to operate control panel (see picture above). If we start from the top of the control panel and work down, the first item is the tank-full light. Obviously this illuminates when the tank is full and the auto-stop has kicked in. Thankfully in addition to the light there’s a viewing window into the collection bucket in the bottom corner of the unit, which if you get on your hands and knees you can peer into to view the current water level. The tank-full light also illuminates if the water collection bucket is not in the correct place, so after emptying the bucket make sure you slot it back in correctly or the machine will not switch back on. The 2-litre collection bucket is standard for a dehumidifier of this size and comparable with the competition. The bucket itself comes with both a lid and top-mounted carry handle, which is enough to avoid any casual spilling on the journey to the nearest drain. Next is the ioniser button. Ionisers work by charging the air particles, which makes them attracted to each other and to earthed surfaces such as walls, where they can be easily removed through normal cleaning, improving the air quality. A great addition by DeLonghi here, although ionisers on desiccant dehumidifiers are common. The DNC65 also comes with an anti-microbial filter that is permanently in place that filters dust, bacteria and mould spores from the air. 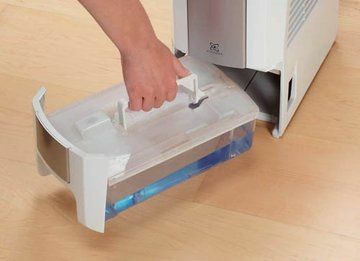 If you’re using your dehumidifier most of the time you should clean the filter by giving it a vacuum roughly once per week. The DeLonghi DNC65 comes with a timer function that allows you to switch the machine on for either 2, 4 or 8 hours. This is a really useful energy-saving feature. 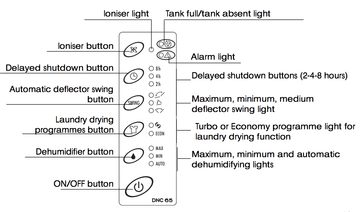 For example, you might need to quickly dry some clothes with the DNC65, but you’re going out so won’t be around to turn it off, so all you’d do is set the machine to the 2-hour timer, rather than having it switched on the whole time you’re out. Next up is the ability to change the angle the air exits the machine, through the inbuilt deflector. You have 3 options to choose from here, either vertical, forwards or forwards and vertical. You may find this useful for targeting problem areas in a particular room, such a mouldy corner. There are two optional laundry modes that can be chosen, either ‘turbo’ or ‘economy’. Both modes increase the power of the unit above the ‘auto’ dehumidifying setting that will be in use the majority of the time on most units. This is in place of a ‘boost’ setting that can be seen on some other dehumidifiers. Selecting one of these settings will improve drying times. 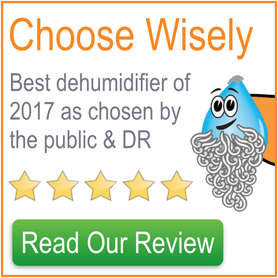 Finally and most importantly are the standard dehumidifying options, where there’s a ‘min’, ‘max’ and ‘auto’ to choose from. The ‘auto’ function is very useful, as it will switch itself on and off to maintain 55% relative humidity, which is in the upper half of the ideal humidity range. We’d suggest most people use it on this setting. The ‘min’ and ‘max’ settings do exactly what you’d expect, run the machine on minimum and maximum, however this won’t set any particular humidity, as that will depend on the insulation in your home, climatic conditions, etc. There was no choice but to score the DeLonghi DNC65 maximum points here, as it’s just about the smallest and lightest full-sized dehumidifier on the market, weighing in at just 5.5kg and measuring only 17cm deep. It possesses an ergonomic top-mounted carry handle, which coupled with the low weight and narrowness makes it a breeze to carry short distances around the home. Besides the depth, the DNC65 is 29cm wide by 47cm high, which is similar to the competition. One of the problems with the DNC65 we’ve spotted is that due to the design, the instructions demand that you place the unit at least 20cm from walls in all directions to ensure proper airflow. This is a shame, as given the narrow dimensions I believe a good number of people are going to want to push the unit out of the way against a wall, which would then decrease performance. However, this is a problem with nearly all dehumidifiers. Appearance-wise the DeLonghi DNC65 is definitely function over form, with it’s boxy proportions ensuring minimum width but not aesthetic appeal. The silver panels on the sides look good, but the large intake grille on the front is ugly. 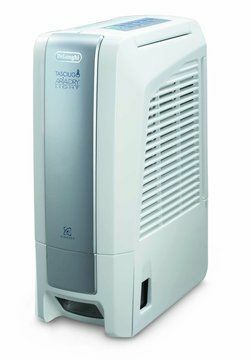 Being a good-quality desiccant dehumidifier, you’d expect the DeLonghi DNC65 to be quiet, and provided it’s not on ‘max’ or ‘turbo’ mode, it is. I don’t think you could quite call the unit ‘whisper-quiet’ as DeLonghi do, especially when they also advertise that is produces 34-44dB. While the unit is in normal operation, you’d only be able to hear it during those quieter television moments and thankfully the fans make a very ‘white’ noise that does little to disturb. While the DNC65 is good, we feel that the competition is actually a little quieter. The DeLonghi DNC65 is a relatively powerful machine, being quoted to extract up to 6 litres of moisture per day at “any temperature”. 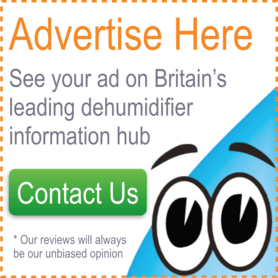 In-fact, under UK temperatures the DNC65 should extract more moisture than most domestic refrigerant dehumidifiers. This is because refrigerant dehumidifiers extract best under high temperatures, whereas desiccant machines extract roughly the same, so long as the temperature is above freezing. This means that the DNC65 would have plenty of extraction power for 3 bed homes or flats. If you’re in the market for a desiccant dehumidifier then you certainly will not go far wrong with the DNC65, it’s very small, quiet and relatively powerful. If not on sale it can but expensive at £189.99, where other models would be much better value. However we’ve seen sales at this store take it well below the price of competing models, making it good buy.